Amanda’s note: If you’ve never seen mukhwas, this recipe is going to strike you as strange at first glance. It looks like a container of candy cake sprinkles or some such. It’s actually a very clever way of cutting your craving for dessert after a meal because you actually only eat a teaspoon or so. You just pop it into your mouth and chew it. The sugar and flavor of the fennel and cumin and very satisfying after a meal. Here Ramya describes how to make your own. Ramya writes from India on her website WildTurmeric.net where you can find more traditional Indian recipes and remedies. I’ve since added a dye-free recipe option below the Indian classic. 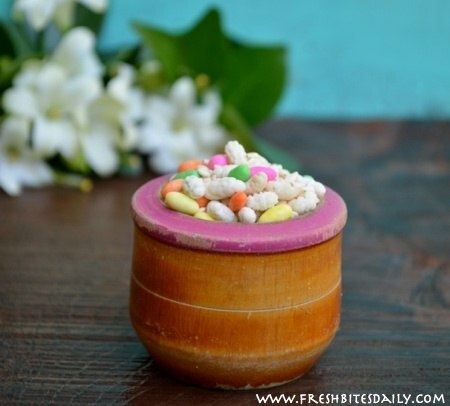 Breath fresheners are very popular in India and they have been around for a long time. There are wide variety of breath fresheners made with different ingredients. I personally love breath fresheners — they taste great and have possible health benefits. Breath fresheners are usually served after a heavy meal — even by most of the hotel restaurants in India. Both cumin seeds and fennel seeds aid in digestion and are perfect for having after a heavy meal. This recipe is also high in fiber and make a good snack when I have a craving for sweets. They make a perfect in-between snack that tides me over until lunch. I have used sesame seeds in this recipe which makes this breath freshener high in iron content. If you are a person who is suffering from anemia, try using this breath freshener often. I have tried many different versions of breath fresheners at home and I always come back to the few recipes that are my absolute favorites. This recipe is one among my favorites and it very healthy and tasty. Usually breath fresheners are made with fennel seeds as a base. 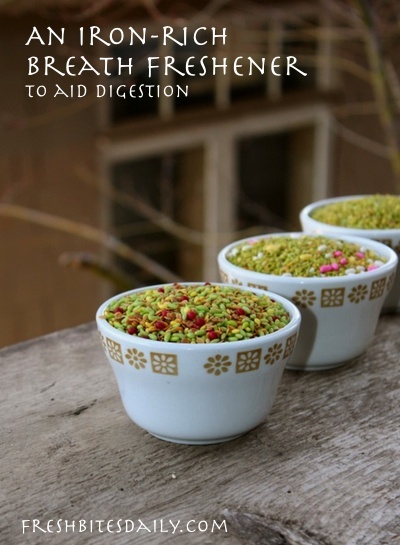 Here in India, we get sugar coated fennel seeds and I used that for the recipe. The rest of the ingredients are sesame seeds, flax seeds, and rose white essence. The rose white essence gives the recipe a mild rose flavor end blends well with the other flavors. (You can use rose water instead.) I also used sugar-coated cumin seeds that comes in different colors for some added color in the recipe. This breath freshener is not too sweet, as I didn’t add any sugar and I prefer it that way. The sweetness comes from the sugar coated fennel and cumin seeds. This recipe is full of nutrients, tastes great, and can be made in a matter of minutes. To make the recipe, toast flax seeds separately in a thick bottomed pan until they pop and are fragrant. Dry-roast the white sesame seeds separately until the color changes slightly. Let the seeds cool completely, mix them with the rest of the ingredients, and store in an airtight box. Dry roast flax seeds in a thick-bottomed pan, stirring it continuously until it start popping and is fragrant. Dry-roast white sesame seeds in a dry skillet over a low flame, stirring all the time until the color changes slightly and a nice aroma wafts. Once both the sesame seeds and flax seeds have cooled down, mix in the sugar coated fennel seeds, multi-colored cumin seeds, a tiny inch of salt, and the rose white essence. Mix everything well together and it is ready to be served. Use only a tiny amount of salt or else it will not taste good. Decrease the amount of flax seeds in the recipe, if you don’t like it. The roasting part is very important, roast in medium to low flame until the seeds are crunchy, taking care not to burn them. Always store these in airtight jars to retain the crunchiness. Follow the instructions for the recipe above, dry roasting your seeds. Add sugar at then end of your blending process. Add more sugar to taste.